As David Garrow’s classic biography of King reports, [Bearing the Cross, New York: Harper Collins, 1986], King went on to say, “Never could I advocate nonviolence in this country and not advocate nonviolence for the whole world. That’s my philosophy. I don’t believe in death and killing on any side, no matter who’s heading it up—whether it be America or any other country. Nonviolence is my stand and I’ll die for that stand.” A few months later King was dead, but not before making one last, indelible declaration of the existential importance of nonviolence. Standing before the jammed crowd at the Mason Temple in Memphis the night before his death, King linked his life wisdom with a pithy and resounding appraisal of our global predicament: “The choice before us is no longer violence or nonviolence,” he said. “It’s nonviolence or non-existence.” This April marks the fiftieth anniversary of King’s assassination—and of King’s clear warning. This is a moment not simply for remembering a great leader cut down in his prime, but also for seriously contemplating the acute clarity of his assessment and what it means for us today. Now, 50 years on, King’s words take on more weight with each passing hour. Fifty years after the watershed year of 1968, we are at another watershed, and Dr. King has put the fundamental choice before us. 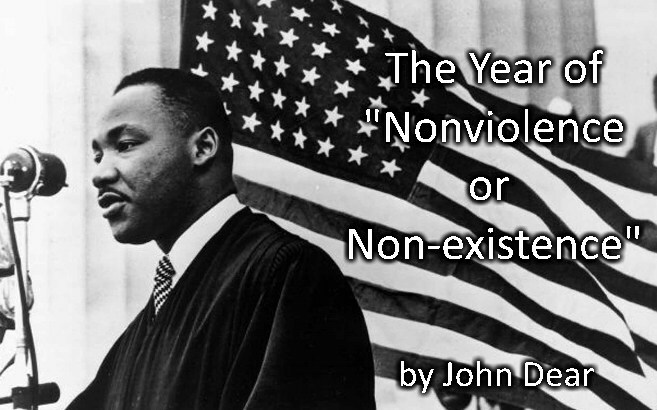 This is the Year of Nonviolence or Nonexistence. Kingian nonviolence calls for active, universal love toward all human beings, all creatures, and all creation, that refuses to kill or be silent in the face of killing. It is a way of life, a spiritual path, and a political methodology toward peaceful conflict resolution and global justice. It means striving to be nonviolent to ourselves and to those around us, trying to be nonviolent toward all the creatures and the environment, and doing our part to build up the global grassroots movements of active nonviolence for a new culture of justice, equality, and peace. “A culture of nonviolence is not an impossible dream,” Pope Francis said recently, following up on his 2017 World Day of Peace message, “Nonviolence: A New Style of Politics,” the first statement on nonviolence in the history of the Catholic Church. But our culture of violence begs to differ. “No, Pope Francis,” it says, “a culture of nonviolence is an impossible dream. No, Dr. King, there is no choice; non-existence is inevitable.” Deep down, that’s what we think, isn’t it? That’s what the culture of violence, the voice of despair, tells us. If we give in to such despair, then our fate is sealed. But this need not be how things turn out. EDITOR’S NOTE: John Dear is a regular contributor to this site. Please click on his byline for further biographical information and an index of his articles posted here, or go to our Author Archives page for access. This article has been shared with paceebene.org, under a Creative Commons Attribution 4.0 International License.